The differences between working on an established farm and starting your own were evident this month. Rather than learning the ropes and falling into developed routines, we’re recreating some systems that have worked on other farms. We’re solving problems unique to our farm. We’re spending a lot of time cobbling together equipment and systems. And often, that costs money. The animal groups we are raising this year afford us the luxury of not needing big equipment. We rely on temporary electric net fencing powered by solar chargers. We are taxing our family well while we wait for the funds to dig a well dedicated to our pasture. We drive a 1989 Ford F250 to pick up feed from the mill, deliver chickens to the processor, and move our hay wagon/shade shelter/water tank around the field. We have neighbors to thank for providing equipment for borrowing, renting or hire. We rented the neighbor’s tractor to pull the county’s drill when we seeded the pasture. Another neighbor who loves having any and all barnyard animals is loaning us transport coops as we build our own supply. And the farmers who rent land from our family bush-hogged 2 acres of Johnson grass while we figure out how we will deal with that problem. Our best resource has been the thrifty, borderline pack-rat nature of our family. 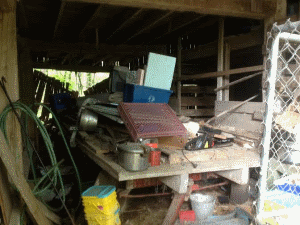 This year, our ever-present project is cleaning barns. Used for storage these last 30 years, the barns are a veritable treasure trove of money-saving, ready for reuse supplies. We fixed up an old hay wagon to haul water until we dig a well. We built a rodent-proof room for grain storage inside the pole barn and it only cost us screws and time. We have not bought any lumber this year and I can’t imagine the time that our lumberyard will be depleted. Finding these treasures does require diligence. In the book The Memory of Old Jack, by Wendell Berry, Jack has the same answer when someone asks him where anything is – “Hangin’ up.” That was true in our barn also: short sections of 2×4 boards labeled “keep this” (but why? ), old pepper plants sans the peppers, plastic bags full of plastic bags, and so on all hanging from the myriad nails that adorn the barn. But we’ve also found utility in some of what’s hanging. For instance, we found an old scythe, which we use to clear strips of pasture for our electric nets. And those 2x4s we’re supposed to keep? 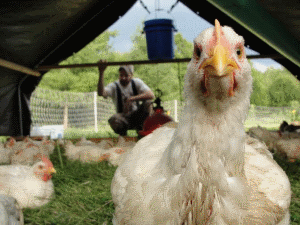 We did – but now they’re a part of the chicken tractors. As we tidy up both trash and treasure, we’re also unearthing barns for us to put to use. On the other side of the curtain, capital is not an easy nut to crack. We have drained our savings – you know, the huge nest egg we accumulated while working as farm laborers. We have a small loan. We have part-time off-farm jobs. The family sold some timber as part of our forest management plan and we got a share. Our farm is generating two types of potential capital, CSA members and potential investors. Our first four CSA members’ dues paid our first grain bill, and though we sell at our first market next week we’re not yet out of money. We have a few potential investors who believe in us and in what we are doing. 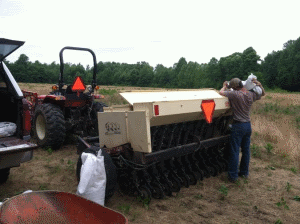 To start a farm there is a predetermined slope – your equipment inventory increases as your capital decreases. We knew this before we started spending money. And we’re not scared; well, not too scared. We’ve written a budget and a plan to turn that around over time, and in the meantime it is easy to step back and see the progress. And that doesn’t depreciate, no sir. P.S. Our first season is in full swing. Our pigs were weaned this month, which meant we picked them up and have them in the barn learning the ins and (not) outs of electric net before they move to pasture. I dropped off our chickens at the processor yesterday, and by the time you read this we will have completed our first CSA pick-up and farmer’s market. And before I write my next blog, we’ll have turkeys. And to think, the days are getting shorter!